When I first started cooking, I would follow a recipe exactly. If I couldn't find an ingredient, then I wouldn't make the dish. I was too new, too uncertain to heed my as yet unidentified cooking instincts, and I was too inexperienced to know that trial and error is one of the best ways to become a better cook. My strict adherence to recipes led to some disasters, such as the enchiladas that turned into soup (thanks a lot Tyler Florence). I had the suspicion that the filling didn't need all of that chicken stock, but the recipe told me to do it. I ended up in tears on more than one occasion. Now that I have a few years of experience under my, uh, apron, more often than not I don't follow recipes to the letter. I am cooking for myself and my family, and I know what we like, so I taste as I go and adjust accordingly. It seems obvious to me now, but a few years ago I was so caught up in following directions that I forgot to actually check and see if I liked the way the dishes tasted. Of course I still make plenty of culinary mistakes, but now I am much more relaxed about them. Flexibility in cooking is not only good for my stress level, it also helps me finish up ingredients that I am not sure how to use. I look at what I have, then run through my mental recipe file (or, more likely, my folders upon folders of bookmarked online recipes) and see what I can make with what I need to use up and what I have on hand. This is what I did when I was left with a giant pile of beet greens after making my Beet and Goat Cheese Tart. I had never cooked (or eaten) beet greens before, but I knew that I didn't want them to go to waste. I considered a salad, but at that point the greens were slightly past their prime. Then I remembered having bookmarked a Smitten Kitchen recipe that had paired pasta with potatoes and arugula. I had been intrigued by the whole carbs on carbs aspect, and since I had everything else on hand, I decided to go ahead and make it, subbing out the arugula with beet greens. I followed the basic recipe, adjusting the cooking times to make sure that the beet stems, which were gorgeous shades of magenta and chartreuse, had time to become tender. I also gave the garlic more time to mellow, and cut down on the amount of olive oil (I tend to think that a lot of recipes go overboard in the olive oil department - I am looking at you Food Network chefs). Overall I really liked this recipe. I love pasta and I am always looking for new, interesting ingredient combinations. 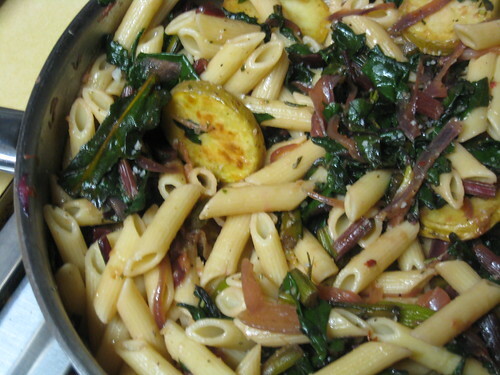 This dish had a nice juxtuposition of flavors, textures, and colors; the sweet red onion with the slightly bitter greens, the tender potatoes and al dente pasta, it all worked very well together. Plus, it tasted even better cold out of the fridge the next day. Ok fine, later that night. Preheat oven to 400 degrees. Place potato slices on a parchment lined baking sheet, brush with olive oil and season with salt and pepper. Flip slices and repeat. Roast in the preheated oven for 15 to 25 minutes, until tender and golden brown. When potatoes are done, put on a pot of water to boil and cook pasta, according to package directions, until al dente. Meanwhile, heat two tablespoons of olive oil in a large skillet over medium heat. 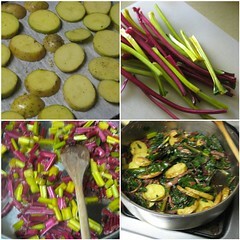 Add chopped beet stems and saute 2 to 3 minutes. Add sliced onion and continue to cook, about 5 minutes, until vegetables are tender. Stir in garlic and cook about one minute, then add chopped beet greens and saute until wilted. Add potatoes and rosemary and toss together gently. Cook 1 to 2 minutes, until the potatoes are cooked through. Drain pasta, reserving some of the cooking water, and add to vegetables. Squeeze the juice from half of a lemon over the top, and drizzle with a tablespoon or two of extra virgin olive oil. Toss together and taste, adding salt, pepper, and olive oil to your liking. You can also stir in a bit of the pasta water if you would like to loosen it up.